Togo’s ruling presidential party on Monday urged supporters to take to the streets to coincide with planned opposition demonstrations against the slow pace of political reform. Georges Kwawu Aidam, the first vice-president of the Union for the Republic (UNIR) told AFP there would be marches on Wednesday and Thursday in support of a controversial constitutional reform bill which the opposition see as not going far enough. A parliamentary panel last Friday approved the bill to revamp the constitution and introduce a presidential term limit after days of protests against the regime of Faure Gnassingbe, the scion of one of Africa’s oldest political dynasties. But the panel rejected wholesale 48 amendments proposed by opposition parties. Aidam said the ruling party march would “say ‘no’ to violence” and hold counter rallies as the opposition steps up its demands, notably to apply a limit on the number of presidential terms retroactively, preventing Gnassingbe from running again in 2020. He has been president since 2005 following the death of his father, Gnassingbe Eyadema, who had ruled since 1967. Opposition parties have long called for the introduction of two-term limits and a change to the two-round voting system. The West African state’s 1992 constitution has been modified a number of times, including by Eyadema, who enjoyed the military’s support and who in 2002 scrapped mandate limits. Jean-Pierre Fabre, the historic leader of the opposition, reiterated his rally appeal on Monday, sending an audio message to the Togolese people via the Whatsapp messaging service. “My dear compatriots… we invite you once again to mobilise to take part in great numbers in the demonstrations that the democratic forces contemplate,” said Fabre, president of the National Alliance for Change (NAC). “We will not have rest until Mr. Faure Gnassingbe has left power as you ask him,” he added. 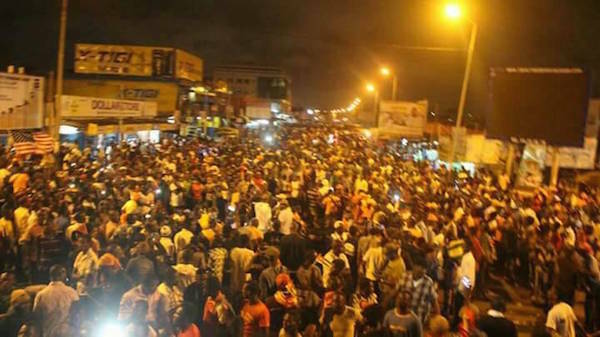 On September 6 and 7, hundreds of thousands of people took to the streets of Lome, Togo’s capital, and in other cities to demand constitutional change. The demonstrators brandished signs and chanted slogans to demand Gnassingbe go. At the weekend, Togo’s bishops slammed “the violence exercised by the forces of law and order” and urged political parties not to organise simultaneous rallies. The ruling party had initially decided earlier this month to organise marches on the same day as the opposition, forcing the latter to change its dates. Aidam insists the ruling party will “defend its values” and that the opposition has no monopoly on the street.